Some movies stay with you forever… I know, yet another Mondo poster, and there's plenty of them now because Fantastic Fest just started up (and that's the home of Mondo). However, this one I just have to feature, for many reasons. It's a poster for Rodney Ascher's documentary Room 237, which explores some of the deeper theories and ideas found in Stanley Kubrick's brilliant The Shining. I've seen the doc twice because it's so damn good and I can't recommend it enough. Beyond that, this is some outstanding artwork, that I want on my wall immediately. I love the eerie blue snowy look and the maze and everything. Must see! From the Fantastic Fest guide: "Rodney Ascher's Room 237 is a fascinating documentary that explores bizarre theories about the subtext and symbolism underlying Stanley Kubrick's landmark film The Shining." This documentary, which first premiered at Sundance and also played in Cannes, is made-up entirely of existing and archival footage, including many different segments of all of Stanley Kubrick's films. It features voiceovers which breakdown and discuss the theories and ideas within The Shining. 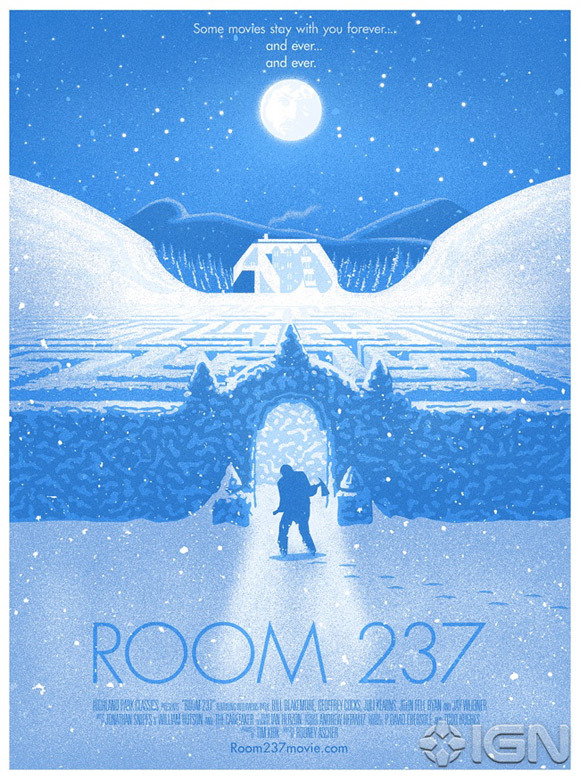 Room 237 is playing Fantastic Fest in Austin this week, where this poster will be available. Luckily, IFC Films picked up the film, and will be releasing Room 237 in limited theaters sometime this winter. Stay tuned for actual release info. Is it me or is there a hidden Swazzie in the top left of the maze? Pretty good for Mondo. what's the significance of the number 42 in the maze? Huh. Didn't notice that at first. Good question.